I shielded my eyes against the bright summer sun as I hopped out of the county vehicle. 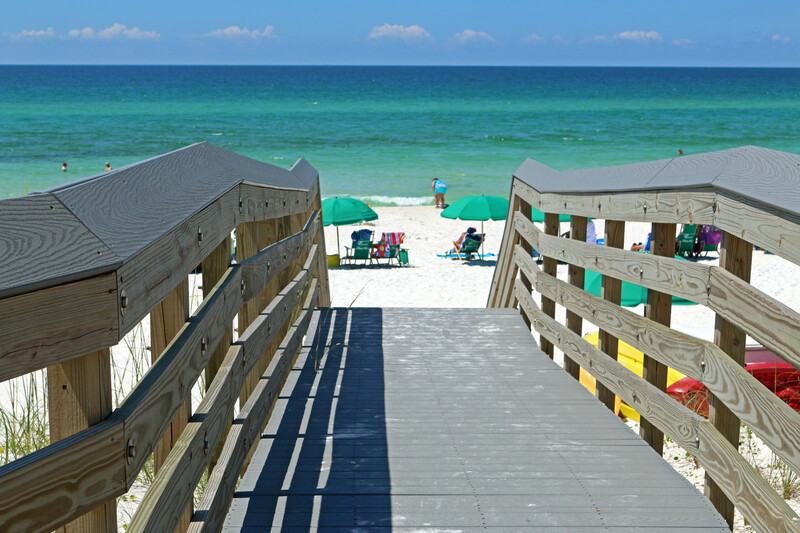 We are in the busy tourist season here on the Florida Panhandle, and I could hear the beach-goers before I saw them. I was on the shoreline to check out the recently completed “dune walkovers,” five new structures linking the inland to the water. Smiling, I recognized that this was one of the best aspects of my job: completing projects that help people and the ecosystem simultaneously. Dunes are gorgeous. They roll gently or peak sharply, undulating across the landscape in shining white mounds. 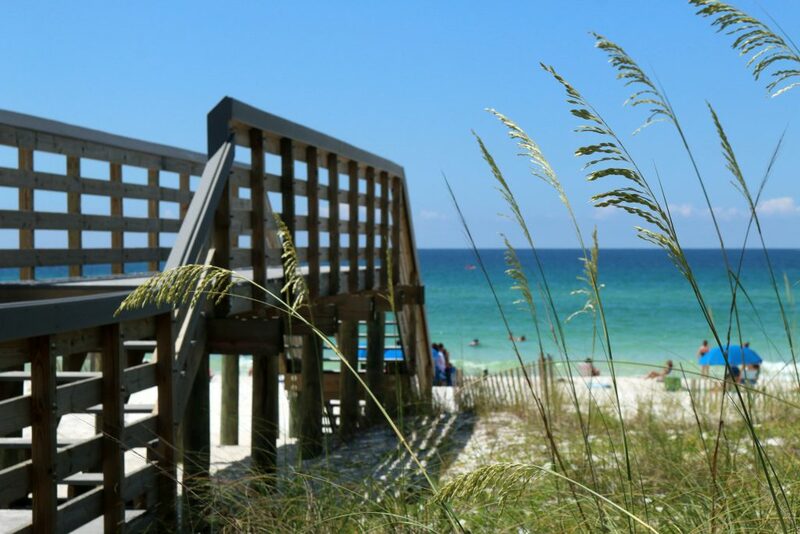 Sea oats and other vegetation – stabilizing the sand structures – wave gently in the breeze and add color to the coastal environment. In addition to their visual benefits to the view-shed, dunes protect property and the beach system as a whole. Unfortunately, they are also sensitive to human impacts. In times of surge or storm events, it is often obvious exactly where people have been crossing to get to the water. 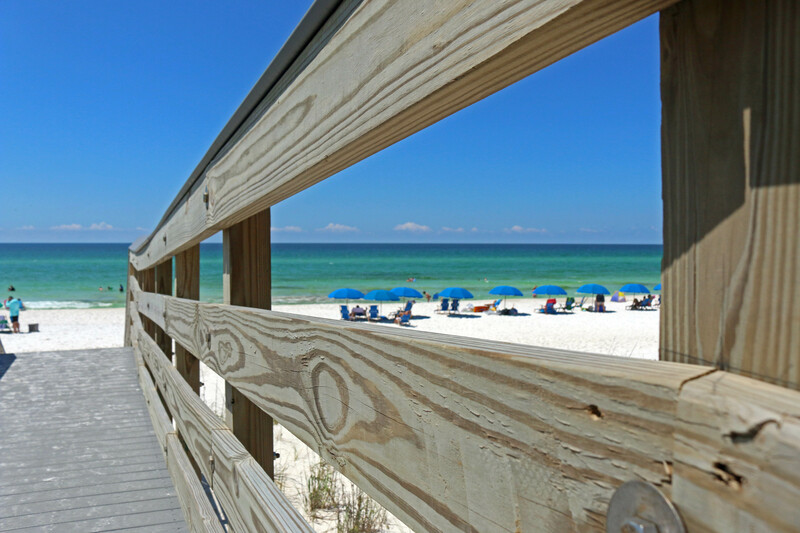 As a result, Okaloosa County used a grant from FDEP and additional funds from the local Tourist Development Council to construct wooden “walkovers” in heavily trafficked areas along Okaloosa Island. Built by county staff, these boardwalk-type structures allow people easy access to the beach, but elevate them above the sensitive dunes. Each walkover was designed around the varying beach topography; some are tall, long, short, etc. Relieved from the pressure of footsteps, the dunes can begin to recover. When protecting beaches, it is important to balance preservation and access. Dune walkovers are a great way to safeguard the unique island ecosystem, and as I write we are looking into other locations where they may be useful in the future! Is Ecotourism the Natural World’s Silver Bullet?